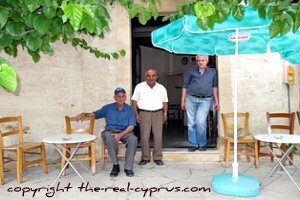 Cyprus Wine Villages have a distinct route to follow created by the Cyprus Tourist Board if wine, food and culture are your thing or you just fancy a day away from the beach or want something other than poolside entertainment. Please note, not every village actually has a winery, sometimes it is classed as a wine village because the grapes are cultivated there. 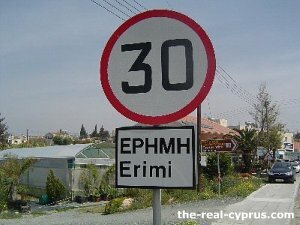 Leave the Limassol-Paphos highway at the exit for Avdimou and on to the F606 and head for Pachna Village. Along this route the slopes are covered with carob trees, so very characteristic of the eastern Mediterranean that shade the flocks grazing nearby. 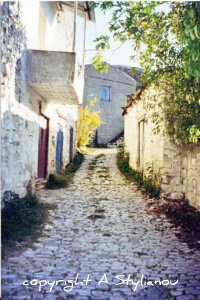 This is a large village of two storey houses built in characteristic limestone blocks and sits picturesquely amid the vines. In addition to the winery there are a couple of tavernas and cafes and a well used local coffee shop. As you drive down the hill there is a panoramic view of terraced vineyards covering the SW flank of Troodos and Mount Olympos above. 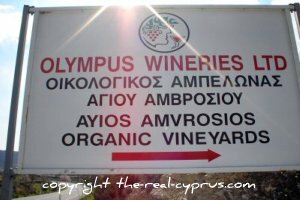 Side Note: The Yiaskouris Winery does not have a website, but you can contact Christos the owner to see if you can visit. I do believe both he and his brother hold down full time jobs other than the winery so weekends may be the best time to make arrangements for. Go left onto the E601, signposted for Omodhos Village and take the E612 to Malia. This villlage has a long history of wine production, and its winery re-opened in 1996. Many of the well preserved stone houses still have stills for making Zivania a local spirit distilled from grape must. Leave the village and continue on the E612 to Arsos Village. 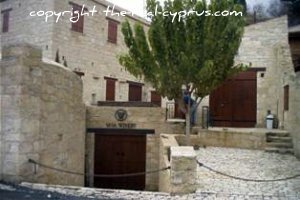 Side Note: If you want to go 20 minutes towards Paphos from here you can visit the Nelion Winery, which falls into the Paphos district and is adjacent to the wine villages but not part of this particular wine trail. This village is scenically perched on a steep chalky hillside and some of its fine traditional houses are holiday accommodation. A walk through the narrow lanes will take you to the local olive press, mineral water springs and the folk art museum, while the wineries are on the outskirts of the village. Along here, the dry stone walls that retain the hillside terracing are home to the large endemic Agama Lizard which you may be lucky enough to see basking in the sun. Side note: Winery in Arsos not open to public. This village was and still is a major wine producing village and many of the red-roofed white houses have pitharia (large wine jars) and Zivania stills in their yards. The compact village has a spring of pure mineral water, a Byzantine museum and several good restaurants. You cannot miss the winery as you enter and exit the village, beautifully restored in local stone in the traditional architectural style of the village. As you leave Vasa you are now heading for Omodhos Village. 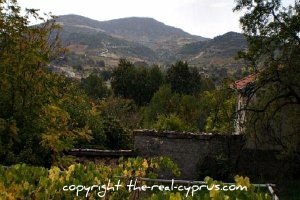 This is the capital of the Cyprus Wine Villages, the Krasochorio (wine villages). The centre is closed to traffic so you can go right into the large free carpark at the entrance to the village. 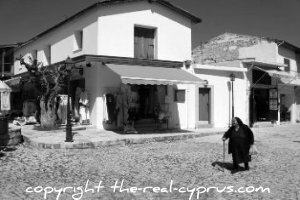 The village huddles around the Timios Stavrou Monastery, at the end of the attractive cobbled square. Wander through the quaint streets among the whitewashed houses to the mediaeval "Linos" (wine press) which is still in very good working order, or visit a rural life museum in one of the traditional houses or you can even watch the village women make intricate cobweb style papilla lace, fine exhibits of which can be seen at the Centre for Conservation of Pipilla lace within te monastery. Around the square are cafes and small shops selling wine, honey and the speciality "arketena bread", baked with chick pea as a rising agent instead of yeast. Away from the square, are several good restaurants. To leave, go right and follow the signs for Mandria and Platres. Along the narrow old road are more wineries and vineyards, after which the vines give way to hawthorn, poplar and apple trees. Go right at the main road and head for Platres. 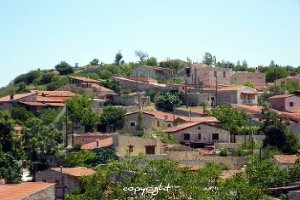 A small community in a picturesque setting among fruit trees with a village winery and several good tavernas on the main road. An altitude of 1, 128 metres surrounding the forests and the Kryos Potamos (Cold River) all help to give Pano Platres its excellent climate. This is a popular holiday resort and a regional centre with several good hotels, the cottage hospital, petrol station, a tourist information office and shops. Leave by either of the two exits for the B8 and Limassol and go right. 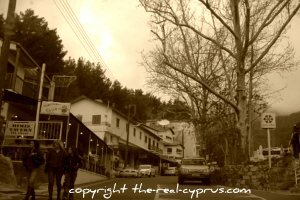 Driving down the steep twisty road the Troodos Forest looms to your left. Stay on the B8 at the major cross-roads. Trimiklini is a good place to stop for coffee en-route, look out for the unusual double bridge that spans the river near by. After Trimiklini, you will be on the eastern escarpment of the Kouris River, with a panorama of vine-clad terraces across the valley. I think the facebook page is better for this winery, the website is only if you want to buy wine, and not a lot of useful information on it or anything about the winery. You can contact them directly by facebook instead. Pass Lania Police Station and go left at the signpost to Lania Village. A well preserved village of narrow cobbled lanes of tile-roofed elongated houses with beautiful gardens and courtyards, where pitharia wine jars store the house wine. The old Linos a wooden contraption in which grapes are pressed, is still there and open all year round for visitors to view. Lania is one of the Commandaria Villages in which the sweet dessert wine is made. It is also home to several artists who welcome visitors to their studios. Go left at the main road and after 100 metres, so right at the signpost to Doros. This village has traditional architecture with two-storey houses with arches and balconies overhanging the winding alleyways. Walk into the dead-end streets at the bottom of the village for a breathtaking view across the Kouris Valley. 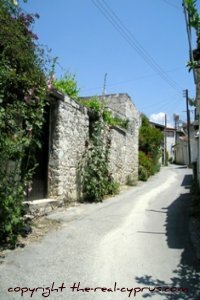 At the village exit, go right to Monagri along a narrow lane that used to be part of the road from Limassol to Platres. 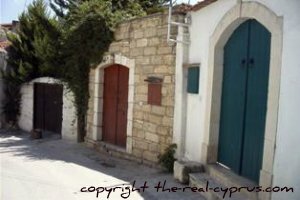 At the village entrance, the centre of two small wineries and a very old olive press are ahead of you. Standing above the river valley to your right is the Archangelos Michail Monastery now a contemporary art centre and nearby, down a road to the left is the Monastery of Panagia Amasgou, which houses some impressive 12th century frescoes. To leave, follow the signs for Limassol and go right on the B8. Down the hill, take the F817 signed to Ayias Therapon and head for Lofou. There is a good view of the Kouris Reservoir and near the village is open pastureland with dry-stone walls. Follow the signs for Ayias Therapon to the exit of Lofou and go right to park. This attractive Commandaria village spread atop a limestone hill (Lofos means hill in greek) has an abundance of water from the Kouris and Kryos rivers. 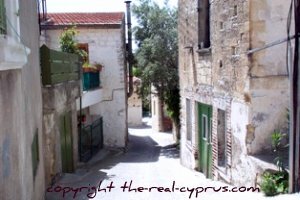 The houses are of typical stone and timber architecture and there are Vahkis scheme tavernas serving authentic Cypriot food, a small Byzantine museum and an olive mill. Continue through the vineyards to Ayias Therapon, going right at the church and taking the right fork into the village. Here are 12 preserved vaulted houses with ground floor arched rooms used as storerooms for pitharia wine jars or donkey stables. Drive across the valley to the junction with the E601 and into Ayios Amvrosios. In this small village of tree shaded whitewashed houses, is a winery, an old olive press and a holy well (agiasma).